Copyright 2012 Walters et al. Background: Daily diaries are often used to collect data on disease activity, but are burdensome and compliance may be poor. Their use in chronic obstructive pulmonary disease (COPD) and impact on the prevention and treatment of exacerbations is poorly researched. Methods: We investigated diary-keeping in COPD and ascertained items that best predicted emergency attendances for exacerbations. Participants in the active limb of a clinical trial in COPD kept daily diaries rating breathlessness, cough, sputum, physical activity, and use of reliever medication. Results: Data on 55 participants, 67% of whom were female, showed that overall compliance with diary-keeping was 62%. Participants educated to primary school level only had lower compliance (P = 0.05). Twenty patients had at least one emergency attendance, in whom the relative risk of an acute exacerbation for an increase in item score rose from six days prior to hospitalization, most sharply in the last two days. Even for optimal combinations of items, the positive predictive value was poor, the best combination being cough, activity level, and inhaler use. 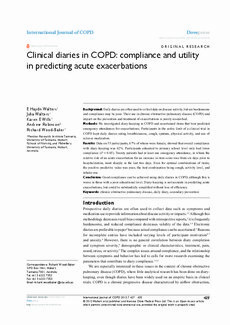 Conclusion: Good compliance can be achieved using daily diaries in COPD, although this is worse in those with a poor educational level. Diary-keeping is not accurate in predicting acute exacerbations, but could be substantially simplified without loss of efficiency.